Organic gardening is the refreshing, healthy way of working with nature to grow vegetables, herbs, fruits and flowers. So just what does it mean to "grow organic?" The organically grown garden recycles natural materials to keep the soil fertile and naturally balanced in nutrients. Organic fertilizer is used to feed the soil. Man-made chemicals such as pesticides and synthetic fertilizers are not used. Yet growing organic herbs and vegetables is much more than just a way of raising plants without harmful chemicals. By recognizing that the role of nature is how life has grown and flourished for millions of years, the principles of the organic garden simply follow the guide written by the natural world. If youre just getting started, youll be surprised to know that the quality of your organic produce will be excellent and the yield plentiful. As with any garden, youll want to choose plants suitable to the soil in your location. The best way to ensure that everything in your garden has been cultivated organically is to grow as much as possible from organic seeds. You can purchase organic garden seeds from suppliers, as well as maintain you own home-raised seed. Commercial organic seeds may either be certified as organically grown (and a bit more expensive) or non-certified. Key to the whole process is the use of organic fertilizer and compost to create good soil. Such fertilizer consists only of animal and vegetable substances. The idea is to feed and nurture the soil, which in turn feeds the plant. When the proper, natural fertility level of the soil is maintained by regular additions of organic matter, the plants will draw on the material as they need it. You supply the natural fertilizers for organic gardening, and nature will do the rest. Herbs should always be a part of an organically grown garden. They are usually easy to grow, quite decorative, and even more practical. Organic herbs attract useful predators of pests to your garden, as well as helpful insects such as bees and butterflies. You can plant herbs around shrubs to aid weed control, or grow them in a traditional herb patch of their own. Fresh, organic vegetables are the pride of the natural gardener. Allow as much room as possible for the vegetable plot in full view of the sun. If space is limited, the cottage garden design is an excellent solution for growing organic vegetables. 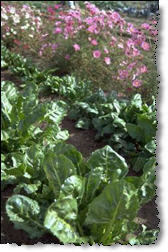 This style of organic gardening uses close-planting techniques in which a mixture of ornamental and vegetable plants are grown in the same bed. Its a wonderful way to make maximum use of any available space. A natural result of this is organic weed control. In fact, there are simple and healthy ways of practicing organic weed control, such as clearing, hoeing, and mulching. Some weeds are actually an asset to a gardens heath, and organic gardeners learn how to recognize the useful weeds from the bad. There is nothing mystical about growing an organic garden. It is a mixture of traditional gardening and natural materials that produces food free from pollution, with the amazing tastes that nature intended!